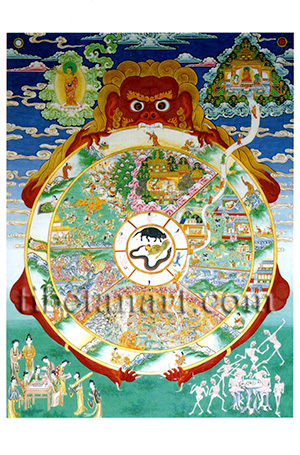 The Wheel of Life is a pictorial illustration of the Buddhist teachings on cyclic existence or samsara. In the central hub of the wheel are a pig, a cockerel and a snake, which represent the three primary poisons of ignorance, desire and aversion. In the second circle are beings that rise and fall into the six realms of existence. These six realms are depicted in the wide third circle of the painting, with the three 'higher realms'; the god realm (top), human realm (upper right), and the jealous god or asura realm (upper left) occupying the top half of the wheel. And the three 'lower realms'; the animal realm (lower right), hell realm (bottom), and hungry ghost realm (lower left) occupying the lower half of the wheel. In the outer ring of the wheel are symbolically illustrated the Buddhist doctrine on the 'twelve links of dependent origination'. The wheel is held in the teeth and claws of a red demon (mara), which symbolizes impermanence and time. In the upper left corner the Buddha stands outside the entire wheel of cyclic existence and points towards the full moon as a symbol of enlightenment. In the upper right corner is the Sukhavati paradise realm of Amitabha Buddha, with a pathway leading from the 'judgment hall' of the hell realm into his heaven. In the lower left corner are a group of nine Chinese ladies who are indulging in the refined arts of playing Go, poetry, painting, etc. And in the lower right corner a group of nine skeletons show the outcome of these refined pursuits.